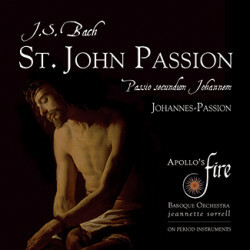 This magnificent recording of J. S. Bach’s groundbreaking masterpiece, the St. John Passion, is the result of Jeannette Sorrell’s visionary concept of a dramatic production which was presented in seven acclaimed performances in Cleveland and New York City in March 2016. Leading her Cleveland-based baroque orchestra Apollo’s Fire, the Apollo’s Singers and a stellar cast of soloists including tenor Nicholas Phan as the Evangelist, baritone Jesse Blumberg as Jesus and baritone Jeffrey Strauss as Pilate, Sorrell’s vision brings immediacy and clarity to Bach’s dramatic setting of the Passion story according to the gospel of St. John. Released in time for Easter, the deluxe package includes an extensive and illumiating booklet that features memorable action photos from the production. 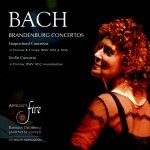 Videos are available at www.apollosfire.org/media/bach-st-john-passion.